Why is PTR the top choice of both public and private institutions? Like all the markets we serve, we’re dedicated to offering equipment that will reduce your organization’s waste streams and get you closer to reaching your sustainability goals. We do this by providing the highest quality, most reliable and safest waste and recycling equipment available in the industry. Private and public institutions, such as those in the Healthcare, Education, Transportation and Military industries, need reliable solutions to meet their sustainability goals. Our equipment has been designed to fit a variety of waste applications from recycled cardboard to industrial waste. An experienced PTR product specialist will help you to decide which unit is best for your organization. We’re on a mission to help companies like yours reduce waste and create a healthier internal and external environment. Click here to learn more. Your organization will experience both waste stream reduction and significant cost savings with our recycling equipment. 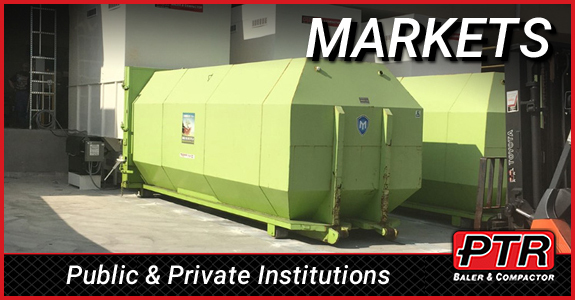 We have an extensive line of Vertical balers in varying sizes to suit the needs of public and private institutions large and small. Cardboard, shrink wrap, packaging material and light aluminum scrap are no match for our Vertical Balers. For non-recyclable waste, there’s many stationary and self-contained compactors to choose from based on your needs. Our Cart Tippers are designed to work with our compactors and will truly streamline your waste handling process even more. Learn more here. All PTR Vertical Balers, Compactor, and other products meet or exceed all OSHA and NOISH recommendations. Each unit is meticulously engineered and undergoes extensive testing and inspection to ensure years of dependable operation. Of course, all PTR units are backed with a comprehensive warranty. Private and public institutions are typically concerned with meeting OSHA and NOISH standards. The PTR Bioloc secure access option is the answer. With the Bioloc, shrinkage is reduced and employees under 18 will be unable to access the equipment. Our Nationwide Service Coverage is the icing on the cake. No matter where you are located in the country, we have service centers and expert technicians close by. From coast to coast, they are prepared to deliver, install and service your waste and recycling equipment. Prompt and professional service is our #1 priority. PTR Baler and Compactor Company is constantly innovating and creating new technology that will improve the efficiency of our products. Our Weight Scale, the Quiet Pump Power Unit, and the PTR Smart Baler are revolutionizing the industry. Click the links to learn more about this, and be sure to sign up for our monthly e-Newsletter to get the latest company updates and product launches.